CAPE CANAVERAL, Florida – NASA announced on Friday the selection of Space Florida for negotiations toward a partnership agreement to maintain and operate the Shuttle Landing Facility (SLF) at Kennedy Space Center (KSC) located on Merritt Island. This historic 15,000 ft. long, 300 ft. wide launch and landing strip hosted 78 Shuttle landings over the past 30 years and provides a unique resource for growing commercial aerospace businesses that may have interest in operating from Florida. NASA Administrator Charles Bolden and KSC Director Robert Cabana made the announcement on Friday during a press briefing at the Kennedy Space Center Visitor Complex. The SLF, specially designed for space shuttles returning to Kennedy, opened for flights in 1976 and is capable of handling all types and sizes of aircraft and horizontal launch and landing vehicles. 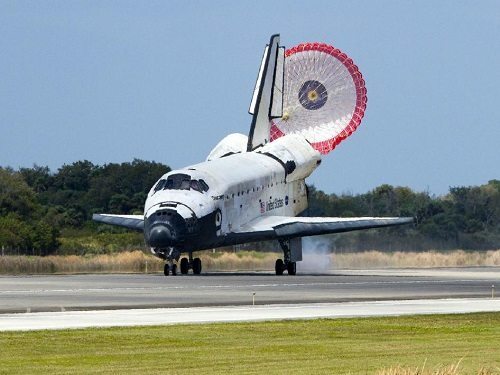 The wheel stops for the final landings of each Space Shuttle were marked and memorialized on the landing strip last year, but are not expected to interfere with future vehicle use of the landing strip. "The SLF is a significant asset for the center that ties our historical past to the vision of the future," said Cabana. "I had the privilege of landing two space shuttle orbiters at the facility and look forward to beginning discussions with Space Florida on a future partnership that will fully utilize this unique resource." NASA issued a request for information to industry in 2012 to identify new and innovative ways to use the facility for current and future commercial and government mission activities. Space Florida was selected because its proposal for potential use of the facility is closely aligned with Kennedy’s vision for creating a multiuser spaceport. The SLF at KSC is the newest addition to Florida’s commercial, horizontal launch and landing-capable spaceports network, joining Cecil Field Spaceport in Jacksonville, which was licensed as a horizontal, suborbital launch site by the FAA in January 2010.